Large collar fits 18-23" neck and has a width of 1". 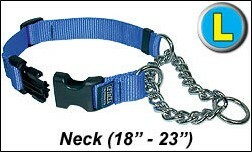 Cetacea chain martingale collars are one of your best choices for a quality training collar. Dog trainers and vets recommend this type of collar when a correction collar is needed. The martingale collar is fashioned after equine designs providing a form of a limited choke collar. The exceptional feature of a martingale collar is that the slip function can be limited to not over-choke your pet. To make the Cetacea martingale more practical than other brands it uses a quick release buckle so that the collar can be put on or removed from your dog’s head without having to readjust the length. 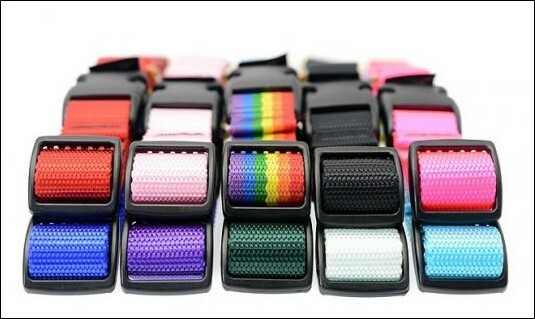 Cetacea collars are sewn using a unique Bar-tack stitch which is remarkably stronger and more durable than traditional "Box X" stitch used by other manufacturers. The Chain is made from steel and is coated with a durable and rust resistant nickel finish while the quick release snap is made of high quality Acetyl plastic. *Measurements noted are for the webbing only; it does not include the chain. Chain adds 3 to 4 inches.